Ever since I killed my first Tamagotchi through near-criminal neglect, I’ve had a love-hate relationship with virtual pets. I’ve been actively following Pocket Creatures since first hearing about it from GDC. It looked incredible and the concept had scores of people intrigued, but the big question remained: can they pull it off? Now that it’s finally here, it’s sadly evident that the answer is: not quite. At least not yet. Pocket Creatures starts you off in a mysterious underground chamber with an egg. Inside the egg is a blatantly adorable Pokemon-like creature, for which you must choose the name and color. Once your creature is hatched, stone tablets start to appear. Collecting each one launches some basic instructions. It’s a fairly clunky tutorial method, and it really only gets more irritating as the game goes on. Once you’ve got the basics down, you’re ready to take your fuzzy little pal outside. Outside is where the magic happens. In this idyllic woodland setting, you can take care of all your pet’s needs, from food to sleep and love. Pet interaction is a big part of the game, since your pet is moody little fella that requires a lot of attention. Different actions produce different effects, for example, petting makes him happy and creates healing rainbows, while poking gets him mad and creates thunderclouds over his head, which you can then use to zap things with lightning. Get too zap-happy and you may end up with a naughty pet who gets into mischief without you, but keep him happy and content all the time and he’ll be sweeter than sugar. In addition to taking care of your pet, you can also grow a magical garden, discover other animals, and dig up hidden treasures. Gardening is really at the heart of the game, since you’ll spend a lot of time caring for the plants and looking for new seeds. The various animals you uncover also double as tools, like the handy platypus shovel or anteater watering can, and they can be fed to become instant fertilizer sources. Ew. Gardening does get repetitive after awhile, but the little world is large enough that there should be plenty to do. Why, then, does the game fall so short of expectations? Visually, the world is stunning, but getting around is a challenge. The game would have seriously benefited from a zoom function, as you spend a lot of time awkwardly dragging the camera around or calling to your pet. The world is also a little cramped, but iPad users will be glad to hear that this is a universal app, so navigation may be a little easier there. Unfortunately, the touch controls are also wildly imprecise, and it is far too easy to grab or interact with the wrong thing. There’s no lasting damage, but it is very frustrating to go to feed your pet and end up accidentally slapping him instead. But the biggest issues, by far, are the many technical glitches still rampant throughout the game. Near constant bugs, freezing and crashing make the game practically unplayable. I’m hopeful that these will be resolved in time, but it is a crushing disappointment in a game that looks so polished at first glance. There is still plenty of potential here, but it’s very difficult to tell whether or not Pocket Creatures will be able to recover from their premature launch. Bottom line: It’s a fantastic concept and it looks beautiful, but the game just isn’t together enough to deliver. 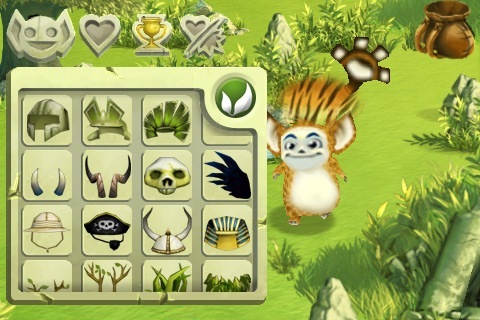 AppSafari review of Pocket Creatures was written by Tracy Yonemoto on May 26th, 2010 and categorized under App Store, Games, iPad apps, Resource Management, Universal. Page viewed 4274 times, 1 so far today. Need help on using these apps? Please read the Help Page.